PETER: Good afternoon. Welcome to CBC and this special live day-time edition of the National. I’m Peter Mansbridge and with me here is Barbara Frum. PETER: We really have no time to waste, so we’ll jump right into it. 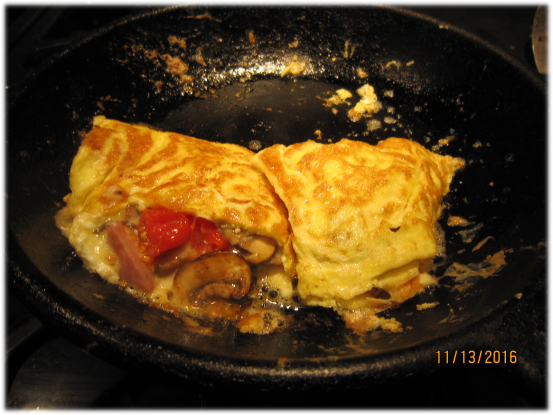 You’re looking at a photograph of a genuine Canadian-made omelet, featuring eggs, milk, cheddar cheese, mushrooms, tomatoes and Ukrainian sausage from Uncle Ed’s. It’s the only photo our team was able to get before the battery died, but you can see it clearly enough. There’s really no doubt that it’s what it is. PETER: The word on the ground is that the craving hit at around midnight, Sunday night, mountain time — that’s what we’ve got, and it’s really quite interesting, Barbara, because we all know that Blogger’s previous post made mention not only of mushrooms, but of eggs and sausage as well. Can we really call that a coincidence? BARBARA: Yes, indeed Peter, it’s really quite fascinating, and you just have to ask yourself, DID SHE SEE THIS COMING? PETER: Yes, Barbara, you’re right — one would think that she had those ingredients in her fridge at the time of composing Post 219, so the real question here is which came first, the blog post or the egg? BARBARA: Ha ha, yes, Peter, but as I said, Peter, the main thing we want to know is DID SHE SEE THIS COMING? PETER: Well put, Barbara, but since I’m the more important journalist around here, I think my questions are better phrased than your questions and nah nah nah. BARBARA: Oh yeah? Well Peter, I’m tired of getting underestimated and I think my on-air make up is thicker and smoother than your on-air make up and oh look we’re running out of time and stay tuned for the local news and look at that I got the last word isn’t that nice. JULIA: And good evening, welcome to this Tuesday edition of ITV . . . Claire Martin is here and she’ll be delivering the weather to us in an English accent. CLAIRE: Oh thank you, I think, for your introduction but what exactly is your problem with my accent, Julia? Don’t you realize I’m the niece of Barbara Edwards, the United Kingdom’s very first female weather presenter? If you think I’m going to be ditching this accent anytime soon then you got another thing coming, honey! CLAIRE: Well, folks, it’s been a really lovely and unseasonably warm November for us here in the greater Edmonton area, with almost zero snowfall. Looking outside, you’d think it was the middle of October, but of course, you and I both know that you’re not looking outside, because you’re so busy watching me on TV! CLAIRE: Ha ha ha — alright, so later on today, we expect a high of about 6 degrees and we’ll have a mix of sun and cloud. Tomorrow will be a little bit cooler and you can expect a temperature of around plus 3. Looking ahead to the rest of the week, Thursday and Friday will be our colder days, with a high of only minus 4 degrees Celsius. For those of you who are looking for an excuse to wear your expensive “Canada Goose” parkas, it won’t be quite cold enough, but we all know that weather never gets in the way of those who are truly Fashion Forward. Nice boots, eh? Back over to you, Julia. JULIA: Thank you Claire, and now for a look at the entertainment world, we’re going to be turning it over to Blogger, who will probably be serving up a new dish of ninety’s hits with Catholicism on the side. Go ahead. BLOGGER: Uh, thank you Julia. What’s your issue with Catholicism, huh? JULIA: Nothing — I’m just saying, you know, you usually, you know, like, mix that in. BLOGGER: Yeah, so what’s your point? BLOGGER: You wanna piece a me? JULIA: Well, no, but — well, yeah! Let’s go! BLOGGER: Alright! You’re on! Right here! BLOGGER: And a warm welcome back, to all our faithful viewers. As Julia mentioned, I’m here with your entertainment updates for November 15th. BLOGGER: We’ve got one song that made it through the rigorous evaluation procedures this time around. That’s right; we’ve got one inspired song for 1994. Joe is standing by, and he’s going to give you a sampling of “Baby I Love Your Way,” by Big Mountain. Go ahead, Joe. JULIA: Hey! That’s a cover version! They didn’t sing it first! CLAIRE: My thoughts exactly, Julia — that’s Peter Frampton’s song, and he’s from England too! He released it in 1975! No fair! BLOGGER: Oh be quiet. Big Mountain did it reggae style and it’s way better with that mellow pacing and sunny laid-back mood. The slight changes to the lyrics were also inspired. Let it rip, Joey. JOE (giving a thumb up): You bet.